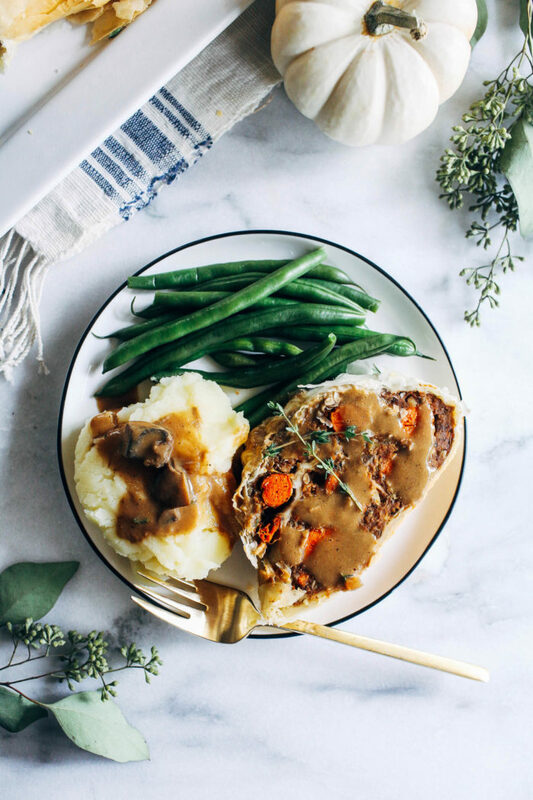 Vegan Wellington- a plant-based version of the classic beef wellington that’s perfect for sharing at the holiday table. Can also be prepared the day before and cooked the day of! I’ve been loving reading through all of your comments on the giveaway about what you’re thankful for. Counting our blessings is kind of like free therapy, right? I need to remind myself to do that more often. 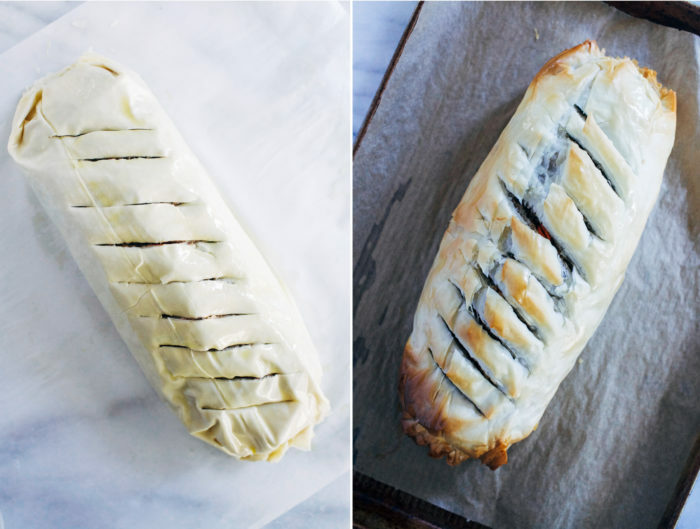 So some of you might have seen the title for this recipe and thought to yourself, “What the heck is Wellington?”. At least that’s what I thought when I first saw it on the menu at a wedding we attended earlier this year. The bride and groom were both vegan so all of the food was plant-based and they invited guests to bring their dogs too. It was basically my idea of a dream wedding. Traditional Wellington is usually some sort of beef roast wrapped in puff pastry. Not exactly my cup of tea. 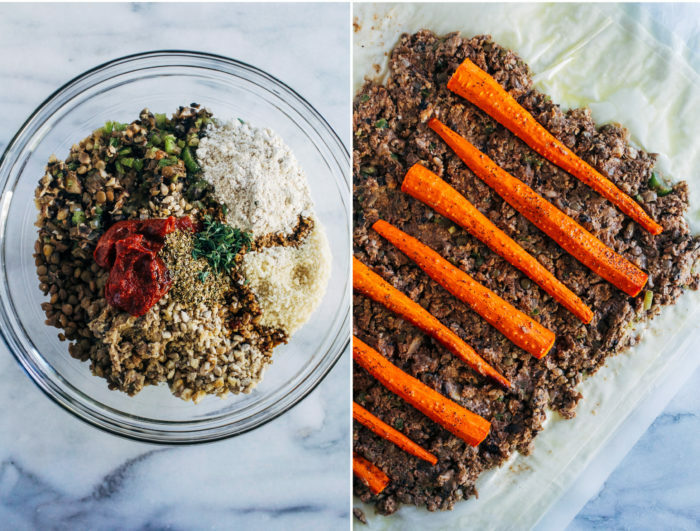 But the version we had at the wedding was stuffed with something similar to my Mushroom Lentil Loaf and it was so good that I wanted to eat the entire thing to myself. What you see here is a scaled down version of my lentil loaf paired with roasted carrots and wrapped in phyllo dough. I went the phyllo route because I couldn’t find any vegan puff pastry that wasn’t made with hydrogenated oils. I’ll be damned if I’m going to buy that garbage. Phyllo dough can be a little tricky to work with since you have to brush each sheet with butter to keep it moist and flaky. It’s also made from wheat flour so it’s not gluten-free but you can always make your own gluten-free puff pastry, if necessary. Bob’s Red Mill has a recipe here that looks promising! 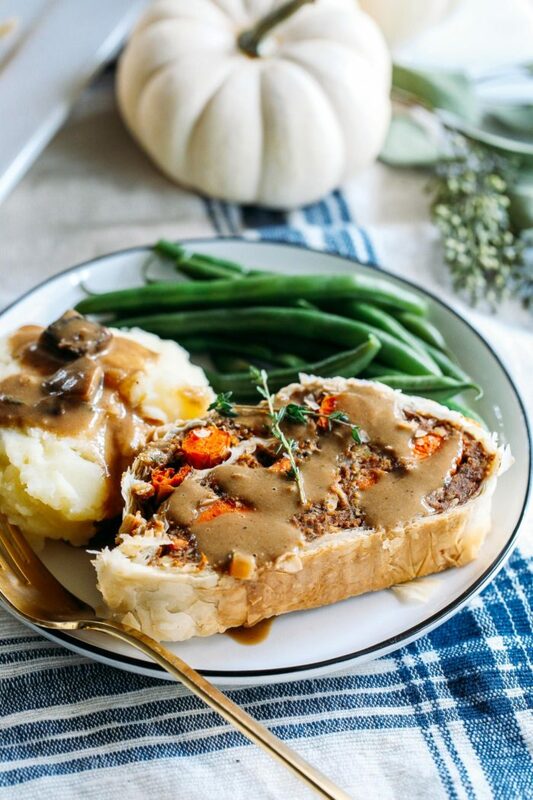 This vegan wellington is the perfect thing to serve at a special event since you can prepare it the night before and bake the day of. I have plans to serve it for Thanksgiving this year since we’re hosting Brandon’s mom and she is much more open-minded than some of our family members. 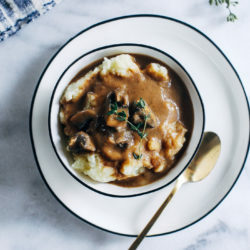 Be sure to keep an eye out for the mushroom gravy recipe which I’ll be sharing with you tomorrow. It goes so well with this wellington! Preheat the oven to 400° then line a baking sheet with parchment paper or a silicone mat. Slice the tip of the stem off of each carrot and lightly peel (if desired). Arrange on the baking mat, spray with high heat cooking spray (or oil), sprinkle with salt then bake in the oven for 25-30 minutes, or until soft. Set aside to cool. In a large pot, warm the olive oil over medium heat. Add the onion and cook until translucent. Then add the mushrooms, garlic, and celery, and continue to cook for about 10 minutes, until soft. Add the balsamic vinegar and cook until most of the liquid is absorbed. Set aside to cool. To a food processor, add half of the lentils and pulse a few times, until finely chopped. Add them to a large bowl along with remaining cooked lentils and mushroom mixture. Add the salt, pepper, breadcrumbs, walnuts, sunflower seeds, tomato paste, Worcestershire, oregano, and thyme. Sprinkle half of flour over top then stir to combine. Add the remaining flour and continue to mix until well combined. If mixture seems too wet, add more breadcrumbs or flour as needed. Refrigerate while you prepare the dough, for about 30 minutes. Set then oven to 350°F. On a large sheet of parchment paper, carefully place one layer of phyllo dough on top. Brush with melted butter then carefully layer another piece on top. Continue to brush each sheet with butter and layer until you have about 12 sheets. Add one last sheet on top and do NOT brush it with butter. Take the cooled lentil mixture from the refrigerator and layer half of it along the center of the dough, using your hands to spread it out into a rectangle about 2 to 3-inches from the edges. Arrange the carrots on top with 1 to 2-inches in between. Press them gently into the lentil mixture. Take the remaining lentil mixture and shape into a log. Place it on top of the carrots closer to one side then gently fold the edge over top and roll like a burrito. With seam side down, brush the outside with melted butter. Cut diagonal slices into the top with about 1-inch in between. Transfer to a baking sheet (on top of parchment paper) then bake in the oven for 35-45 minutes, until outside is golden brown. Allow to cool for 5-10 minutes. Slice individual pieces then serve warm with gravy and enjoy! 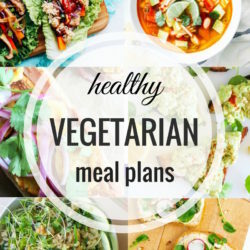 *To prepare 2 cups cooked lentils, soak 3/4 cup dry lentils in a large bowl covered with several inches of water for at least 6 hours or up to overnight. Strain and rinse then add to a pot with 2 cups vegetable broth. Bring to a boil, reduce to a simmer and cook for 20-30 minutes, until lentils are soft. Strain excess liquid before using in recipe. **For the best texture, I like to use the food processor to finely chop the vegetables, nuts and seeds prior to cooking. Just roughly chop then add to the processor and pulse a few times until finely chopped. You can also do this (and mash the lentils) by hand if you don’t have a processor. ***Phyllo and puff pastry dough are not gluten-free. I couldn’t find prepared vegan puff pastry without hydrogenated oils so I chose to use phyllo dough. If you’d like to make your own vegan/GF puff pastry, see this recipe from Bob’s Red Mill. Or if you are okay with gluten, this is an easy recipe for homemade puff pastry you can prepare the day before. If you would like to prepare the recipe in advance, you can assemble it and brush outside with butter then stop at that step and wrap tightly with saran wrap. Then just bake before serving the day of. Yum! You’d be so proud of me- I made a vegan loaf with a lot of these same ingredients on Sunday to eat for lunches. Who am I? Haha. Yours looks better, though. I tried to make mine pretty, but it didn’t work. Wow, this looks so beautiful. 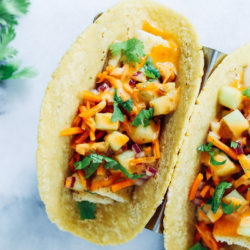 Good job creating a vegetarian alternative to a classic. That wedding sounds awesome!! If I could redo my wedding, I’d make it a vegan event. How fun would that be?! 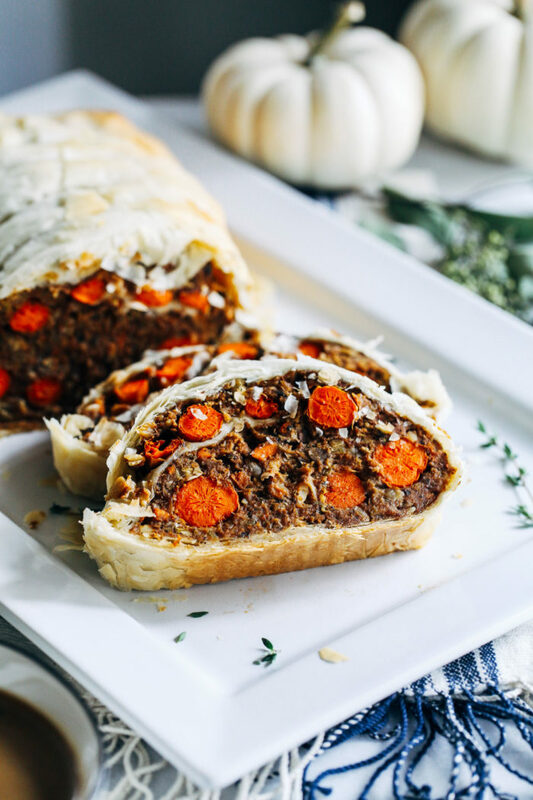 On another note, this wellington sounds amazing… such a creative way to celebrate the holiday season meat-free! This is the wellington of my DREAMS!! 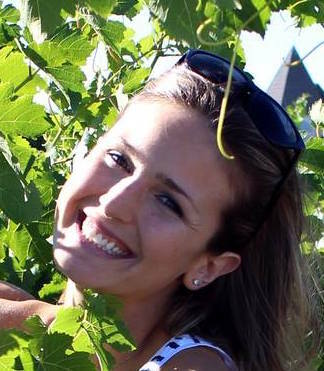 You’re combining so many of my favorite things into one— I must try this sometime soon! 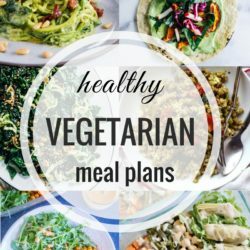 What would you suggest to use instead of mushrooms?? Maybe add an another 1/2 cup of cooked lentils? That seems like it would be the easiest substitution. 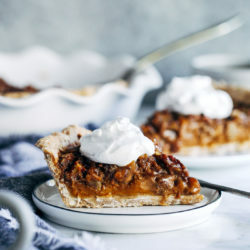 Wow Sarah this is one incredible vegan Thanksgiving option! I made classic beef wellington at cooking school and it was SO rich and over the top. I could have stopped at the mushrooms and been happy. :) I love the sound of the lentil mushroom filling and it’s such a great idea to use phyllo dough to keep those calories down! Can you suggest a substitute for the lentils as they really don’t agree with my body…I would love to try this recipe it looks Yum and a great festive idea!! 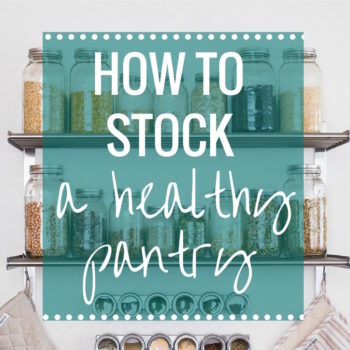 Hi Gaye, You might be able to replace them with 1 and 1/2 cans chickpeas. It will significantly change the recipe but it might still be good! 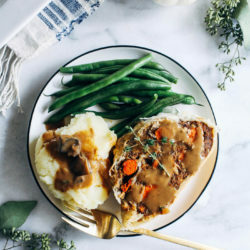 I made your “Vegan Wellington” as an entree option for Christmas dinner and it was great! It took me about 1 1/2 hours to put together (day ahead) but I think it was worth the time and effort. I also made the gravy you suggested…added some almond milk to make it creamier. So thank you from my vegan kids and from me! That makes me so happy to hear! Thank you for the review, Christine! When do you add the onion mix to the lentils please? Yes, parsnips would be a great substitute!